Many centuries ago there was a great state which now not to see on the world map. The name to it was Grand Duchy of Lithuania. The grand duke Mindovg based it and the capital made the city of Novogrudok. The majestic castle, was built in the city, on picturesque hills, here and the crowning of Mindovga took place. His follower at the beginning of the 14th century put a kostel in the city with the milozvuchny name of the Lead – you will get acquainted with history and the present of the grand-ducal cities during the excursion. At the beginning of the 17th century representatives of a Catholic award – Dominicans located in Novogrudka. For them the church was also built that combines elements of magnificent and festive baroque and late classicism. What was only not seen by the temple: soldiers and fires, granary and furniture warehouse, desolation and elimination of an award. However in the best times at a church the monastery and school worked. The writer and politician Adam Mickiewicz studied at school of this. At the beginning of the 14th century the Grand duke Lithuanian Gedemin invited in Novogrudok Frantsiskantsev. About hundred years they worked on creation of the temple – Saint Anthony's church. The temple is complete - but in 50 years the Catholic award is forced to leave the monastery. However, despite destiny milestones, it reached our time, let a little modified. In the city you still should learn about its history and a role. Pushkin, Ryleyev, Bestuzhev, Delwig, Vyazma admired Adam Mickiewiczs verses. He was born in the territory of present Belarus, wrote in Polish, lived and worked in Europe, and died in Turkey. However from everywhere soul pulled it home – on Novogrudchina where there will take place the excursion - among an infinite scope of the hills and fields penetrated by the rivers. There passed the childhood and Adam's youth, the house where he lived remained. In the city the monument to the best poet of an era of romanticism is established and man-made «Mound of Immortality» where long time people carried the earth from different regions of the World is built. Here the memory of the person who made a huge contribution to development of the Belarusian and Polish literatures is immortalized. 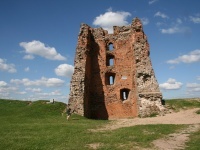 Novogrudok – the first capital of Grand Duchy of Lithuania. The city with thousand-year history kept surprising landscapes of hills and the woods, the view of which opens from Zamkova Hora. And on it ruins of the majestic castle where many centuries Mindovg was crowned back tower. The Novogrudsky lock, located at hill top, is visible for many kilometers from the city – its towers as if giants, are cut down from a boulder, from a distance reported about power and greatness of fortress. 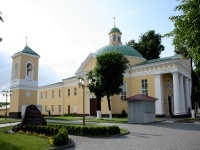 At the beginning of the 18th century, in the territory of one of the first Belarusian churches constructed by Vitovt in 1395, the Farny church was built. The excellent view of it opens from Zamkova Hora. The white monumental temple with a red roof favourably contrasts with fine landscapes of the hilly area. Having seen it, you hardly learn in the cathedral is mute. Before you the beautiful palace will be. However, having thumbed through pages of the past of Sacred and Mikhaylovsky church, you learn in what a secret of its shape and history. How fate of the temple existing since the time of Public relations of the 17th century up to now was? Long time in Lida attempts construction of Catholic temples anyway became. However all of them came to the end extremely tragically – pagan aggression, disapproval of the prince, the fires of crusaders. So was to the middle of the 18th century. In 1770 in the city the Roman Catholic Parish Church of Erection of the Sacred Cross appeared. 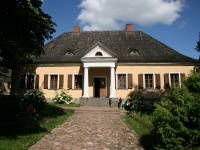 The outstanding architect, the founder of refined architectural style, after called "vilensky baroque" - Johann Christoph Glaubits became the architect of the project. 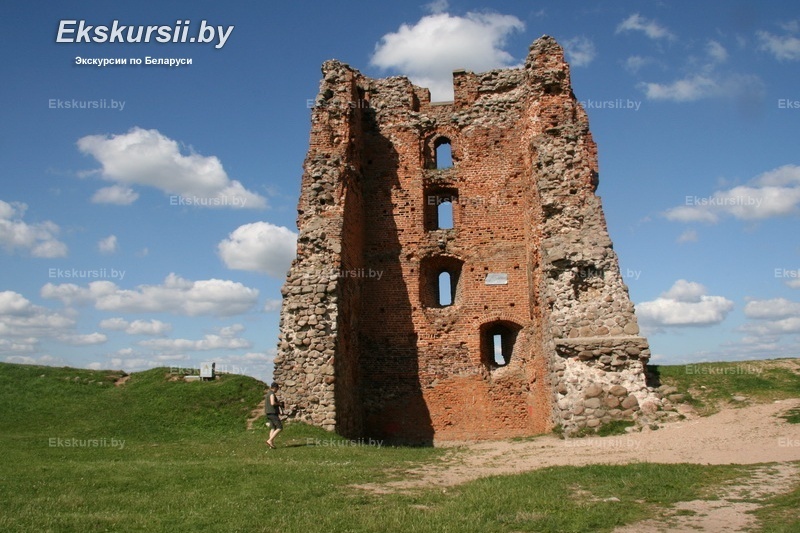 In 1323 the prince Gedimin gave the order to put the stone lock to cover to knights the road to the center of lands of the principality Lithuanian. In 5 years the kostel was built. Time the lock was besieged by the English, German, French knights. The Lidsky lock is "time machine" and a fascinating travel to the Middle Ages where continually there is a place to romanticism and knightly valor. Here everyone will be able to feel as the ancient soldier, having tried on an armor and to like the mystical atmosphere, having learned what ghost protects a citadel. 21-June-2018 Очень Благодарны за экскурсию гиду Олесе, прекрасная экскурсия, все понятно, ясно. Большое ей спасибо. 31-August-2017 Просто супер!! Экскурсовод выше всех похвал!!! огромное спасибо, остались под большим впечатлением! Также были на экскурсии 30.08.17 (обзорная по городу Минску), проводил молодой человек - очень интересно и познавательно, отвечал на многие мои вопросы, - мы в восторге!!! Будем еще к вам обращаться! 24-August-2017 За 10 дней пребывания в Республики Беларусь мы много где побывали. Не посетили пару-тройку мест. Общее впечатление от страны на 4. Просторные проспекты, чистота полей и лесов, замки и крепости, интересные исторические факты и знакомство с жизнью и бытом белорусов. Все было хорошо. 22-July-2017 Степан-веселый, умный и очень профессиональный экскурсовод!